If temples are the greatest legacy of Indian culture and ethos, it is artist Shilpi who brought those Gods and Goddesses inside that hoary and holy sanctum sanctorum to the homes of the devotees through his exceptional artistic skills. Shilpi started his art work to the delight of the readers through the popular Tamizh weekly Anandavikatan in the year 1948 serialized with the title ‘Thennattu Chelvangal’ (The Wealth of South India). It is amazing that he had visited almost many temples in the south and brought just the portraits of the deities but also the beauty of the sculptures in those temples. These were brought out as two volumes in a very meticulous manner by Viktan publications. The two volumes carry the prefaces from Shilpi’s contemporary artist Gopulu and the volume 2 by his only student Padmavasan. 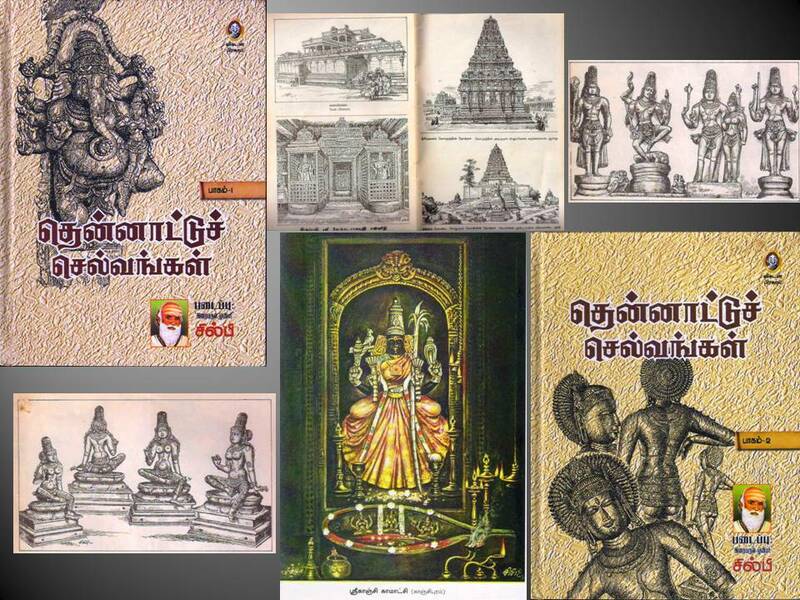 These books are treasures for not only the devotees but also to the art lovers who would be surprised by Shilpi’s immaculate reproduction of the temple art on paper with his ink and brush. I am attaching some pieces of his art work for those who love art and sculpture.